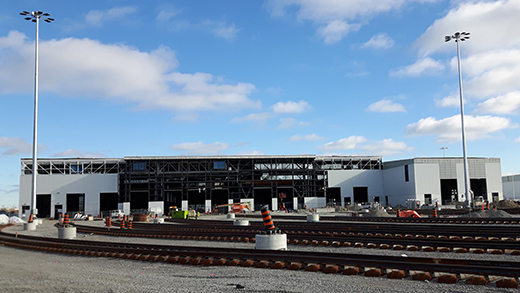 We're building a 500,000 square foot facility in Whitby to maintain and repair our trains. Visible from Highway 401, the new facility will provide mechanical maintenance, body repair, day-to-day cleaning, and operational services. It will also ensure that we can support the biggest expansion in GO's history. We're working towards two-way, all-day transit with 15-minute service or better within the most heavily traveled Metrolinx-owned rail corridors. We're planning twice the train trips during rush hour, and four times the number of train trips outside of rush hour and on weekends. Currently there is only one GO Train maintenance facility for the whole system, located in Etobicoke. Site preparation and grading works started in summer 2012. Construction Substantial Completion was awarded on March 14, 2018. Deficiency identification and correction will follow and is anticipated to take approximately six months. Facility operations will coincide with that of completing construction deficiencies throughout the fall of 2018.